This is Kali who rules the fireplace in my living room. She is from a folk painting made in a village near Varanasi, India. I traveled there in 2008 and bought this from our tour guide. I’ve been taking an online class through The Shift Network. Our teacher is Mirabai Starr, a wonderful woman who I am thanking most for introducing me to the concept of inter-spirituality (you can appreciate and practice more than one perspective). Our class is called The Way of the Feminine Mystic. Mirabai is most known for translating Teresa of Avila and other saints and mystics. She has made Teresa more accessible, especially to one such as I who only looked East for inspiration and wisdom. We are to do a project by the end of this class, something to do around a female mystic or wisdom figure. I chose Kali (or did She choose me?). 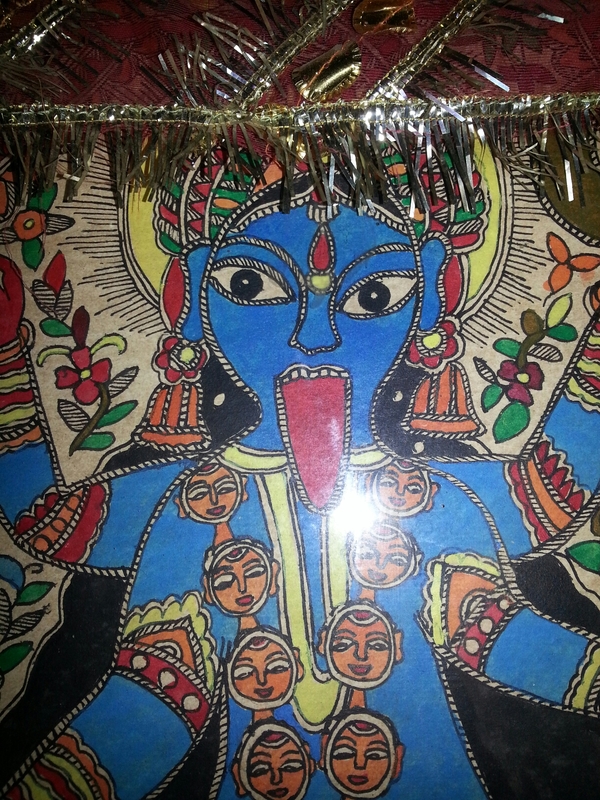 For several months now, I have been writing short poems to and about and for Kali. I always sit on my couch right in front of Her (except for a few written in an airport). They nearly always surprise me for I never know what will come forth. Now reaching poem #60, I am past the halfway mark. I feel I have just begun. Since I have come from a zen tradition, I’ll accept this beginner’s mind as a good thing! Anyway, this morning I decided to stand right up there before Her and take a close-up of Kali’s face. Enjoy!